Explore New Zealand, by traveling from top of the North Island to the bottom of the South Island or any places in between with Flexipass - a 'Book As You Go' hop on/off bus, scenic coach, ferry travel and sightseeing pass, that allows you to travel on New Zealand's largest scenic bus/coach passenger travel network and Cook Strait ferry sailings between the North and South Islands all year around. With Flexipass, you can travel in any direction, at any time, to 500 communities, towns, cities, ski/snowboarding fields, National Parks and major tourist destinations throughout New Zealand, on the combined national scenic bus/coach travel networks of InterCity Coachlines, Newmans Coachlines, awesomeNZ and Great Sights - with its premier sightseeing services - everyday! Flexipass is sold in blocks of travel 'Hours', allowing you to travel on regular InterCity, Newmans bus and coach services or any Great Sights sightseeing journeys or a mixture of both, in any direction as many times as your hours allow. If you run out of travel 'Hours', you can 'Top Up' your Flexipass with additional travel 'Hours' online or by calling the Flexipass Service Centre using a national tollfree phone number. You can create your own itinerary by downloading the Flexipass Travel Planner and choose a travel option/s from a range of suggested travel plans for the North Island and South Island or just travel when you want too. You can search online for the necessary travel 'Hours' for each travel sector/s you would like to use and enter each travel sector 'Hours' on your Flexipass Travel Planner. Your Flexipass covers all of your travel components. When you book advise, Flexipass Service Centre which of the sights and optional extras ( for the entrance fees, boat cruises, scenic flights, meals etc) you'd like to take part in and will be charged your credit/debit/prepaid/travel card. So, if you want to explore New Zealand - click to purchase your Flexipass pass. Flexipass can not be used for travel on the TranzAlpine train between Christchurch, Arthurs Pass and Greymouth. Travel on the TranzAlpine train is additional to your Flexipass. Top Ups for Flexipass are available in 3 Hour or 10 Hour lots. Top Ups is for your existing Flexipass only and will not extend your Flexipass expiry date. With the Flexipass Travel Planner, you can create your own New Zealand holiday or vacation by planning your travel and make reservations from a wide range of accommodation from backpacker hostels, budget accommodation, Bed and Breakfast inns, guesthouses, apartments, motels and hotels. 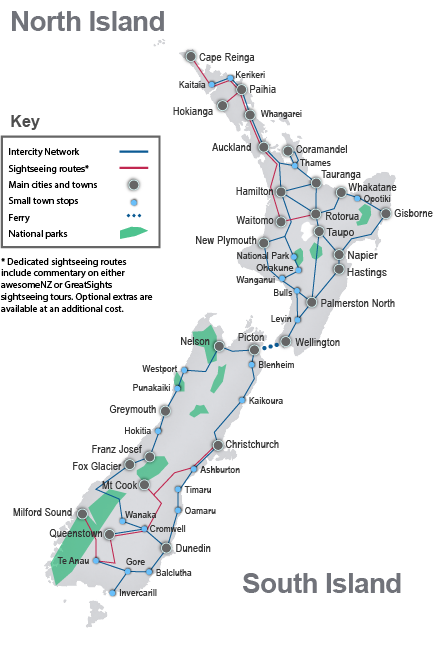 Alternatively, you can have one of our knowledgeable friendly travel consultant's plan your New Zealand holiday, set up your Flexipass and make the respective travel and tour reservations for you including the TranzAlpine train, by contacting our Travel Centre team by phone or Skype call or chat.